Seriously, it’s the most annoying thing ever. The good news is that you can identify what’s draining your juice – and do something about it. 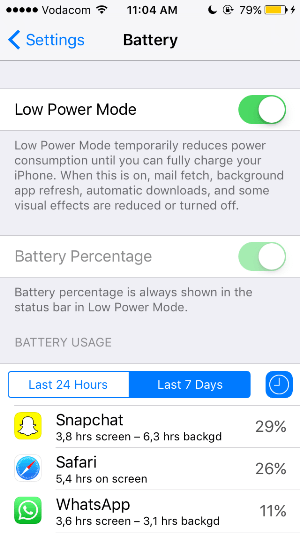 On your iPhone, go to Settings > General > Battery – this will pinpoint the apps draining your battery. As this handy feature has shown, background activity is one of the worst offenders on this particular user’s phone. 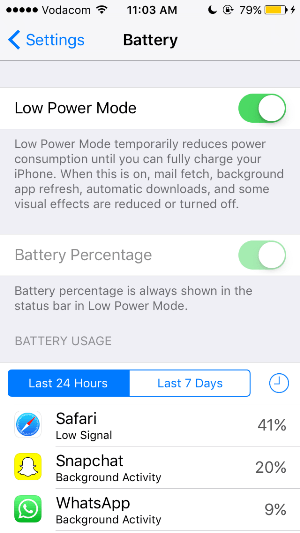 To solve this, first go to Settings > General > Background App Refresh – and make sure it’s turned off.Turning off the apps when not in use will also preserve battery life. If you use the Facebook app, you’d find that it appeared at the top 3 of the worst offenders list. By removing the Facebook app from your iPhone and going to Facebook through your browser you can extend your iPhone’s battery life by 15 percent, reports The Guardian newspaper, which tried it. This little trick works especially on Android phones, the newspaper reports. Last year Facebook came under fire because the app automatically showed videos in the background even though users hadn’t opened it. This function affected battery life and used valuable data. “Go back to the Nokia 3210,” writes The Daily Record.